The Sample Business Case for Records Management is an illustration of a completed version of the Business Case for Records Management document. Use the sample as a guide for creating your own custom document. This Sample Business Case for Records Management is included in an editable format that can be customized for your own needs. How do you write a Sample Business Case for Records Management document? 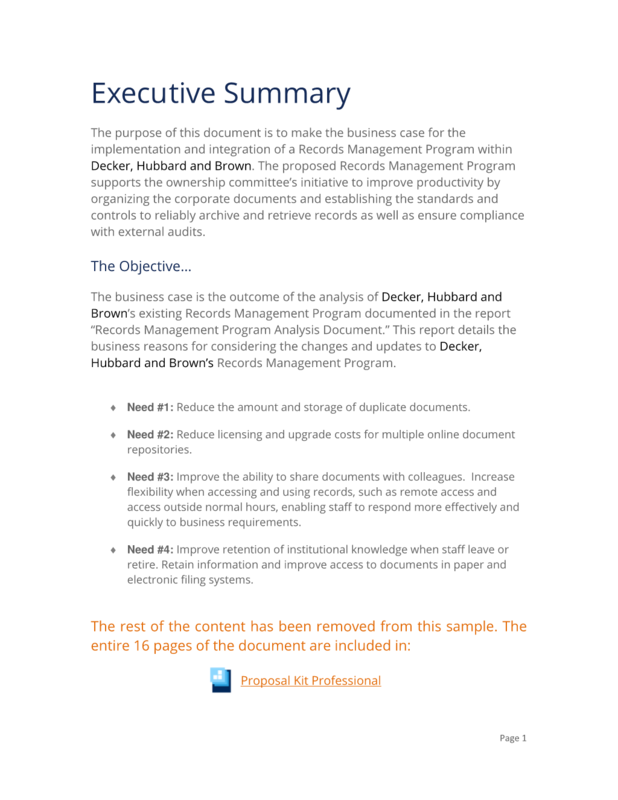 The purpose of this document is to make the business case for the implementation and integration of a Records Management Program within Decker, Hubbard and Brown. The proposed Records Management Program supports the ownership committee's initiative to improve productivity by organizing the corporate documents and establishing the standards and controls to reliably archive and retrieve records as well as ensure compliance with external audits. The business case is the outcome of the analysis of Decker, Hubbard and Brown's existing Records Management Program documented in the report " Records Management Program Analysis Document. This report details the business reasons for considering the changes and updates to Decker, Hubbard and Brown's Records Management Program. Reduce the amount and storage of duplicate documents. Reduce licensing and upgrade costs for multiple online document repositories. Improve the ability to share documents with colleagues. Increase flexibility when accessing and using records, such as remote access and access outside normal hours, enabling staff to respond more effectively and quickly to business requirements. Improve retention of institutional knowledge when staff leave or retire. Retain information and improve access to documents in paper and electronic filing systems. More effective organizational planning through better management of and access to information. The Records Management Program highlights the importance of effective records management and the opportunity for enhancements to the productivity of the business and stakeholders that can result from improved records management policies, procedures and systems. Goal #1: Develop a central records repository. Goal #2: Enable access to company records over the Internet. Goal #3: Improve worker productivity. Goal #4: Improve audits and controls. Goal #5: Increase access and knowledge sharing. Goal #6: Reduce the storage of duplicate documents. Goal #7: Protect sensitive information. This report has been developed to provide the assessment of the current records management state and the reasons for proceeding with the Records Management Program; including the options, requirements, cost, benefits, and management of updating and improving the existing Records Management Program. A program assessment was performed to gather enough information to enable management to determine whether or not to proceed with upgrading the existing Records Management Program and to identify technology that may help with Decker, Hubbard and Brown's goals. The Status of Decker, Hubbard and Brown's Records Management Program. Decker, Hubbard and Brown's corporate Records Management Program does not have a formal role within the organization. Storing the documents and identifying critical records is performed at a departmental or individual level and is combined with other roles and responsibilities. The long term management of documents is not seen as an important area of responsibility. Decker, Hubbard and Brown has a records management policy covering file naming conventions, and there are multiple open and unsecured records repositories. Decker, Hubbard and Brown does not employ a trained records manager or someone with official responsibility for the management of the organization's records, and there are no records management training initiatives. The Current Environment of Records and Information. Decker, Hubbard and Brown's electronic and paper information is stored and maintained in multiple electronic document management software (EDMS), also known as Enterprise Content Management (ECM) software applications, and network file shares. Most of the company's documents are generated electronically and stored electronically. Most paper documents received are scanned and placed in either a file share or EDMS, and then shredded or stored in a file cabinet. There are no corporate policies and procedures in place for the evaluation and disposal of documents and no preparation is taken to ensure the long-term preservation and access to electronic information. Partial backups of the corporate information and documents are performed nightly and full backups are performed bi-weekly. Critical records required to keep the business operations functioning in the event of a disaster are not identified and governed by a policy or procedure to identify critical records and their management. Decker, Hubbard and Brown will want to develop policies and procedures for the Records Management Program. The company will need to communicate to the organization how the policy is distributed to the staff, when to perform policy reviews, formalize the maintenance of records in all formats, and address how the records policy is implemented. A records survey of Decker, Hubbard and Brown's documents is necessary to understand the exact nature and scope of records in the organization and to understand the effectiveness of storage and use and to be able to address the corporate mission and strategic objectives. A preliminary SWOT (Strengths, Weaknesses, Opportunities, and Threats) Analysis of Decker, Hubbard and Brown's business highlights the following strengths and opportunities that can be further leveraged to provide insight for the motives to upgrade the Records Management Program. The analysis also covers the consequences of not implementing a new approach to records management and helps identify how much risk is the organization may incur by doing nothing. Consolidating repositories and applying retention to records that can be destroyed will cut costs on storage and software licensing. Allow users to easily review and research successful projects. Rapid deployment for the program. Cut cost and reduce storage. Open access to excellent documentation for clients and projects. Rollout of the program is fast and changes are done quickly if desired. Better customer service for the strong customer base. Over a decade of legacy documents that will reduce cost by not recreating things. Maintain steady growth through automation * Consolidate content stores. Open communication between business units will keep us from recreating the wheel. Rapid deployment of the program will reduce the potential fines from an IRS audit and speed up third-party audits of financial systems. Increase document security. Develop a communication plan to promote the program and gain enthusiasm for the new system. Review and create policies to streamline current processes. Increase information management and security. Develop policies and procedures that reduce duplicates. No formal change management process. No formal training and change management. High volumes of project and legacy documents. Due to the organization of the business, change can be rapidly deployed. Consolidating repositories and applying retention to records that can be destroyed will cut costs on storage and software licensing. The following project requirements will identify the administrative, technical, financial and other requirements to implement a Records Management Program or expand on an existing one. Effective governance and company adoption of the Records Management Program needs to come from the senior management and individuals need to be identified along with the roles and tools of the program for it to be a success. Develop a company Records Policy and Procedure. Users must be trained on how to comply with the policies and procedures. Develop a classification scheme or file plan that organizes files and folders into logical groupings. Define metadata that needs to be captured and used for searching documents. Identify or acquire personnel to manage the ongoing retention and disposal of records. Design a process for efficient and effective storage and retrieval of records. Develop security and access controls for all documents. Establish a records management, information technology management and advisory committee to deliver governance of the records program. Devise a plan for vital records and disaster preparedness or emergency plan. Decker, Hubbard and Brown's technical requirements address exact technical needs based on information gathered from the Program Analysis report. Strategy for Enterprise Content Management (ECM) Requirement: Decker, Hubbard and Brown has volumes of documents in multiple repositories that need to be centrally managed and migrated to a single source. Consolidation of existing systems and documents on the network file share. Management of records and metadata for the purpose of central administration. Satisfaction of ECM Requirements, which include the ability to able to store, manage and render documents and records in their native file formats. Web-based ECM system for access anywhere. Records Management Requirement: Decker, Hubbard and Brown needs the ability to manage all corporate documents according to organizational policies and to manage the complete document lifecycle to ensure regulatory compliance and reduce corporate risk. Support for a Decker, Hubbard and Brown organizational classification scheme and file plan. Ability to create classification schemes with a minimum of three levels of classification; Function, Transaction, and Activity. Ability to make changes to the classification scheme. Changes tracked and logged in an audit trail. Ability to declare a record by a time or event trigger, such as a cutoff date. Ability to perform a legal hold and freeze records and series by authorized users. Capture Requirement: The central record system must be able to leverage technology to organize and manage Decker, Hubbard and Brown's records. The solution will need to automate and streamline processes to minimize the need for extensive training and change management. Ability to capture bulk import records and metadata. Ability to import native files from the desktop. Ability to scan paper documents. Ability to automatically import documents or records and propagate metadata for like series or groupings. Ability for knowledge works to contribute to the system and assign records categories at time of import. Business Process Management Requirement: Decker, Hubbard and Brown needs to improve communication and collaboration of distributed documents like purchase orders, project documents and invoicing. The system must reduce the dependency of implied knowledge for business processes. The central repository ECM system must have the ability to create a workflow using a standard GUI. The workflow engine must have standard out-of-the-box capabilities. Integrate with Standard Operating Systems Requirement: Decker, Hubbard and Brown uses the Microsoft platform and the ECM system will need to work with older versions of SQL & Exchange. The system shall integrate into Microsoft SQL, Exchange, Office, Outlook, and Active Directory. The system must have out-of-the-box desktop application integration with Office, Outlook and the network file share. The proposed solution will be for Decker, Hubbard and Brown to migrate existing content to a centralized repository and improve on electronic records management. Funding should be set aside for a pilot program and additional resources budgeted for at least three years for the development and rollout of the enterprise solution. Decker, Hubbard and Brown will need to hire personnel, assign existing resources, and/or acquire services and technology from external suppliers. Implementing a Records Management Program requires involvement from internal and external resources. Records Management Role Records Management Program Responsibilities Director / Senior Management They have the overall responsibility for the success of the organization and are the ones setting its strategic goals and objectives. They should be included in all status reports. Legal The legal department is responsible for ensuring that the organization is in compliance with its various legal and regulatory requirements and will be involved in the design of the ECM system. Communications Department A communication plan is critical and should start as early as possible. Procurement Acquiring a vendor or integrator will facilitate the need to go out for bids. ECM Administrator Manager of the technology solution - usually an IT resource. IT Support Desktop integrations, server maintenance, ECM deployment, general help desk. IT Group IT's role is to ensure that the records repository is developed and implemented according to Decker, Hubbard and Brown's technology and architectural requirements. Business Unit Managers Responsible for the operations of departmental functions, or other business units. The Business Unit Manager's staff will be required to participate to implement the Records Management Program. Managers need to understand the amount of involvement for staff so that the department can continue to run effectively. Information Stewards Typically individuals who understand the department's records and may be used as champions and liaisons with the Records Manager. Users The users are the ones who will be using the system and the ECM processes must be workable for the end users. They should be involved in the design and testing. Records Manager The records manager creates the various records management instruments, including records management policies and procedures, records retention schedules, and records-related job aids. This may not be a full-time position. Project Manager Decker, Hubbard and Brown will need to have a project manager to manage the project, schedule resources, and work with any third-party vendors. Develop a file plan. Develop classification schemes. Select and install software and hardware. Perform migration of content from legacy applications. Assist on decisions for how far to go back with historical documents. Decker, Hubbard and Brown will appoint a project manager for the supervision of the selected suppliers and vendors to ensure all deliverables and milestones are met and on schedule. Analysis of potential risks is outlined below. This list of risks is not necessarily a complete list of all possible risks. No guarantee is made that all possible risks have been determined, or if determined, that the analysis is completely accurate. The need for risk management and oversight of the operational impacts of the new Records Management Program should be studied and documented. Supporting the development of a Records Management Program requires that Decker, Hubbard and Brown formally assess risk and prepare for potential issues and create strategies for addressing them before there are problems. High volumes of unorganized documents, disparate file naming conventions, and regulatory requirements are all high-risk components of the records program. A contingency plan is necessary in the event that the online access to documents fails and paper records are not easily accessible. Due to the minimal amount of records management policies and procedures in place and the need for more discovery and analysis of over a decade of information, the likelihood of project delays and a long project cycle is likely. Analysis: Records policies are not accepted within Decker, Hubbard and Brown's culture. Impact: Difficult users and negative feedback can be damaging to a new program. Resolution: Change management, training, and communication plans will be a key component of the Records Management Program. Analysis: Key stakeholders or document silos may not be identified. Impact: Missed stakeholders can reduce the effectiveness of the Records Management Program by bypassing critical steps, documents, and users. Resolution: Key stakeholders should have been identified during the vetting of the classification scheme. Analysis: Missed classified records and secured access. Impact: Inadvertent disclosure of secured records and loss of access. Resolution: The access to electronic documents should be designed to replicate users' current access profiles. Analysis: Drop in Internet connectivity while searching for documents over the web. Impact: Reduced productivity and lack of confidence in the new program. Resolution: The hardware and software should be specified to accommodate Decker, Hubbard and Brown's peak periods. Records Management is a cost center and cost savings may be difficult to justify. Increased productivity is often used to provide financial justification for developing or improving a Records Management Program. Reduced licensing and operational cost of maintaining multiple repositories. Developing records training programs to increase worker productivity. Records management is necessary to maintain a competitive edge. New policies will streamline current processes in increased productivity. Increased information management and security. Improved staff performance through time saved searching for documents. More accurate retrieval of information leads to better business decisions. Reduced staff costs for filing and managing paper records. Reduced storage costs for keeping records with no value and reduce duplicates and recreating existing documents from scratch. Quicker ramp-up times for new hire on-boarding and acclimation to company knowledge. The proposed Records Program will reduce storage, reduce duplicate documents, and reduce licensing and upgrade costs for multiple online document repositories, while providing improved ability to share documents and enabling staff to respond more effectively and quickly to business requirements. Proceed with the detailed records inventory and survey. Develop a File Plan and Classification structure for all content. Consolidate and migrate documents into a single central repository. Develop Records Policies and Procedures. Develop a Governance Plan for the Records Management Program. The design and development of a formal Records Management Program offers long term security and access to corporate knowledge. The program sets the foundation and governance for information management at an enterprise level and enables Decker, Hubbard and Brown to continue to operate efficiently, effectively, and competitively within the organizations industry. The editable Sample Business Case for Records Management document - complete with the actual formatting and layout is available in the retail Proposal Kit Professional.